The Aloysius is one of many rings that looks better in person that it does on our website. 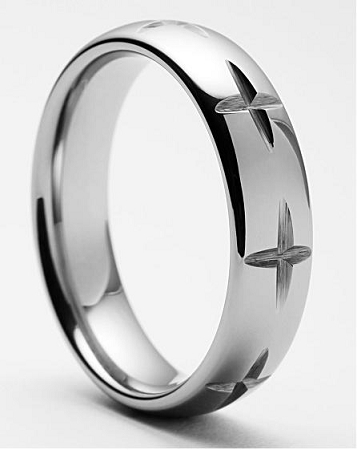 The shine from the inside of the diamond cut crosses/stars give this ring a very expensive and sophisticated look. Comes with a black velvet stylish ring box and FREE SHIPPING! Was this answer helpful? 9 of 12 Customer(s) found this Answer helpful. Q: does this ring come in any different widths other than the 6mm? 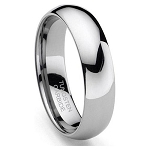 Q: Can I have ALOYSIUS TUNGSTEN ring in 5mm width? A very nice ring, high quality, looks to be very durable. I received the ring quickly as promised. No problems or concerns, and I am quite satisfied. Looks great, feels great!! I find the ring suits my needs as a follower of our Lord. I know that by wearing the ring, I am receiving the graces of my Savior. I like the ring and I would recommend this ring to anyone who wants to be completely with their church or even a bridal set. This ring is very nicely made. It fits perfectly and the design is pretty. The quality of this ring is outstanding, you will show it to everyone. The ring I ordered looks great. Delivery was fast and I received exactly what I ordered. Great job TF.com I definitely will suggest TF.com to family and friends. I did get the rings in a timely manner and the quality of the mechandise seems to be of a very good quality. The only issue that I have is the laser engraving that cost me $30.00 for each is that I cannot even seem them. When a little light hits them I see some glimps of a letter. I was very disappointed with the Engraving so far I only received the item on 9/2/2014 I hope the product holds up to every day wear!!! Incredible craftsmanship. The price is unbeatable. We figured for this price, we would give it a whirl and not sure what to expect. Never did we think that we would get the incredible quality!! Amazing, Thank You! WOW, QUALITY and LOOKS EXPENSIVE! I ordered this ring to replace the 2 gold rings lost in my 43 year marriage. The size is perfect. (Tip: For men - their ring size is usually their shoe size! As was mine.) Although the website says the ring has the words, "Tungsten Carbide" engraved on the inside of the ring, I could not see the "TC" engraving on my ring. My only disappointment is that my Block Lettering engraving is so small I can barely see it. However, that could be due to the shine of the ring and my poor eyesight. real nice ring so far very comfortable to wear great looking! This ring is as expected. I like the shine and durability. The ring I purchased is a duplicate of my wedding ring that was lost and/or misplaced. My wife couldn't believe the design was almost similar to the original ring. Jus got my ring. Girlfriend noticed it right away. Looks great. Fit was perfect from the moment I put it on. It's either crosses ... or stars. We both practice in our faith, but I did not want a ring that was too outright religious. This ring has it all for me. Loved the ring, just had to send it back for a size bigger. The ring and the service were impeccable. I ordered a size to large and they quickly replaced it for no charge and no shipping. I also ordered my wife a heart necklace she loves it. Very Beautiful ! !